In the highly competitive Poland market for facilities management, key vendors are steadily expanding their range of services, venturing into non–traditional service areas, and focusing on ways of extending present contracts. Outsourcing facility management services to the specialized service providers through contracts is majorly seen across segments where comparatively higher maturity is attained, such as the corporate and manufacturing sectors. Transparency Market Research estimates that the Poland facilities management market has excellent growth prospects in the next few years. The market is expected to exhibit a healthy 9.7% CAGR from 2016 to 2024, owing to which, the market, which held an opportunity of US$14.34 bn in 2015, is expected to rise to US$32.62 bn by 2024. In Poland, facilities management services have strong demand from corporate sector due to growing office spaces and increasing adoption of support services to enhance the core business activities. Additionally, with stable expansion of the economy and rising foreign investments in Poland, facilities management market is expected to see traction across the corporate sector in the near future. Presently, the corporate sector is the dominant end-use sector of the Poland, and is expected to account for a dominant 19% of the overall market in 2016. Furthermore, growing infrastructure development across the corporate sector in key cities such as Wronia, Woloska, and Grzybowska across Poland is expected to increase the adoption of facilities management services. Following the corporate sector, retail industry in Poland is also expected to see a vast rise in infrastructure development projects and lead to an increased demand for a variety of facilities management services. The manufacturing sector in the country is also expected to adopt facilities management services at a promising rate due to increasing investments and process automation across the segment. The increasing adoption of technical services such as utilities installation, operation and maintenance of equipment by small factories is creating new opportunities for the facilities management market across the manufacturing sector in Poland. 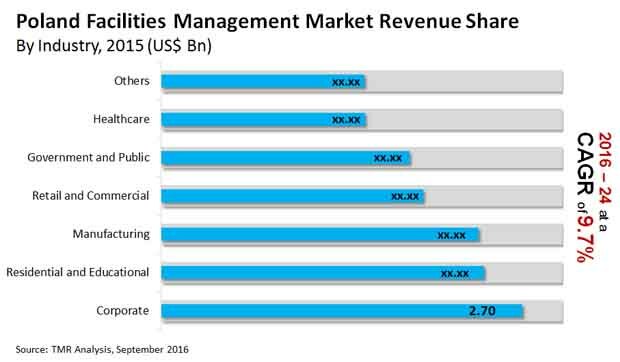 Of the two key categories of facilities management services: hard services and soft services, the segment of soft services holds the leading position and is expected to account for a nearly 60% of the market in 2016. In terms of growth rate, however, these two segments are expected to have almost similar growth patterns over the period between 2016 and 2024, with the demand for hard services exceeding that for the latter by a margin of merely 1%. Despite lagging behind the hard services segment, the segment of soft services facilities management is anticipated to be the largest revenue contributor throughout the forecast period as well. The close gap in the growth prospects of the hard and soft facilities management services is due to demand balance between existing and new customers, wherein soft services are the most outsourced services by both old and new customers. Outsourcing of hard services is largely limited to few industrial sectors, which account for a majority of share of the market’s overall revenues. Effectively delivery of hard services mostly require specialized workforce and certified vendors. Demand for hard services facilities management is especially surging in manufacturing industry as it enables manufactures in achieving an automated environment and improving efficiency in production systems. Bilfinger HSG Facility Management GmbH, Sodexo, Inc., Dussmann Polska Sp.z o.o., Impel Tech Solutions, and Cushman & Wakefield. The Poland facilities management market report provides an in-depth analysis of the outsourced facilities management market for Poland for the period 2014 – 2024, wherein 2015 is the base year and the years from 2016 to 2024 is the forecast period. Data for 2014 has been included as historical information. The report covers all the prevalent trends playing a major role in the growth of the facilities management market over the forecast period. It also highlights various drivers, restraints, and opportunities expected to influence the market’s growth during the forecast period. The study provides a holistic perspective on market growth in terms of revenue estimates (in US$ Bn), across Poland country. The report provides cross-sectional analysis of the Poland facilities management market in terms of market estimates and projections for all the segments across Europe country. The report also covers profiles of major players, their growth strategies, their market positioning, and the various recent developments, and includes market positioning analysis of key players operating in the facilities management market. This research study on the Poland facilities management market provides a detailed analysis of various services type of facilities management available in the market. Based on the services type, the market is further divided into the hard services and soft services. The scope of soft services covers following services – cleaning and pest control, laundry, catering, waste management, security, and others (administrative services, etc.). Under hard services, following services have been considered while arriving at market estimates – plumbing, air conditioning maintenance, fire protection systems, mechanical and electrical maintenance, others (fabric maintenance, etc.). On the basis of industry, the market is segmented into corporate, government and public, healthcare, manufacturing, residential and educational, and retail and commercial and others. The others segment includes sports and food service facilities which require facilities management services to support their day to day business activities. The report includes a comprehensive coverage of the underlying economic development factors under the key trend analysis section. To depict holistic view of the Poland facilities management market, ecosystem analysis is included in the report. The section describes current supply chain model and potential impact of forward – backward integration. The report aims to provide a comprehensive and in-depth analysis of the facilities management market across Poland country, which is segmented into service types and the end-use industries. The report also provides level key trend analysis for different segmentations included. The report also highlights the competition matrix of the facilities management market in Poland, benchmarking all the major players according to their geographic presence, service mix, partner network, relative competitors, key recent developments, and segment growth. The matrix has been designed to show comparative strength of players active in the Poland facilities management market. For market positioning of players, area serviced by them has been considered as major parameter considering variation in service contracts, in particular for integrated service offerings. Also, distinct representation of market competition in terms of market shares of global and regional/local players has also been included. The report also provides key porters five forces analysis in the Poland facilities management market. Under the company profiles section, the report provides an overview of the players operating in the market, the strategies deployed by them to gain competitive advantage, the annual revenue generated by them in the past two or three years, and their relevant business segment revenue. The report also provides market share analysis of the Poland facilities management market. The key players profiled in this report include Bilfinger HSG Facility Management GmbH., ISS World Services A/S, Sodexo, Inc., Mace, Caverion Corporation., Gegenbauer Polska., Dussmann Polska Sp.z o.o., Impel Tech Solutions and Cushman & Wakefield.